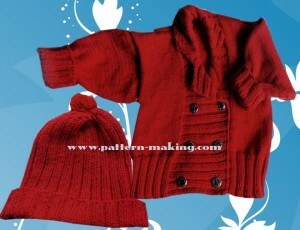 Materials Jacket: 8(9:11:12) 50g balls of cotton double knitting. Pair each of 3 ¾ mm (US 5) and 4mm (US 6) kitting needles, 6(6:8:8) buttons. Hat: Two 50g balls of cotton double knitting. Pair of 4mm (US 6) knitting needles. Measurements Jacket To fit ages 6-12 12-18 18-24 24-36 months Actual measurements Chest 64 70 76 82 cm 25 ¼ 27 ½ 30 32 ¼ in Length to shoulder 30 35 39 43 cm 11 ¾ 13 ¾ 15 ½ 17 in Sleeve length 18 20 23 26 cm (cuff turned back)7 8 910 ¼in Hat To fit ages 6-18 18-36 months Tension 20 sts and 28 rows to 10cm/4in square over st st using 4mm (US 6) needles. Jacket Back With 3 ¼ mm (US 5) needles cast on 66(70:78:82) sts. 1st row K2, *p2, k2; rep from * to end. 2nd row P2,*k2,p2; rep from * to end. Rep the last 2 rows for 7cm/2 ¾ in, ending With a 2nd row and inc 0(2:0:2) sts evenly across last row, 66(72:78:84) sts. Change to 4mm (US 6) needles. Beg with a k row cont in st st until back Measures 30(35:39:43)cm/11 ¾(13 ¾: 15 ½:17) in From cast on edge, ending with a p row. Shape shoulders Cast off 11(12:13:14) sts at beg of next 2 rows and 12(13:14:14) sts at beg of foll 2 rows. Cast off rem 20(22:24:28) sts on a spare needle. Left Front With 3 ¼ mm (US 5) needles cast on 23(23:27:27) sts. 1st row K2, * p2, k2; rep from * to last 5 sts, p2, k3. 2nd row P3, * k2, p2; rep from * to end. Rep the last 2 rows for 7cm/2 3/4in, ending With a 2nd row and inc 0(2:0:1) sts evenly across last row. 23(25:27:28) sts. Change to 4mm (US 6) needles. Beg with a k row cont in st st until front Measures 30(35:39:43)cm/11 ¾(13 ¾:15 ½:17) in from cast on edge, ending with a p row. Shape shoulder Cast off 11(12:13:14) sts at beg of next row. Work 1 row. Cast off rem 12(13:14:14) sts. Right Front With 3 3/4mm (US 5) needles cast on 23(23:27:27) sts. 1st row K3, * p2, k2; rep from * to end 2nd row P2, * k2, p2 ; rep from * to last 5 sts, k2, p3. Rep the last 2 rows for 7cm/2 3/4in, ending with a 2nd row and inc 0(2:0:1) sts evenly across last row, 23(25:27:28) sts. Change to 4mm (US 6) needles. Beg with a k row cont in st st until front measures 30(35:39:43)cm/11 ¾(13 ¾:15 ½:17) in from cast on edge, ending with a k row. Shape shoulder Cast off 11(12:13:14) sts at beg of next row. Work 1 row. Cast off rem 12(13:14:14) sts.